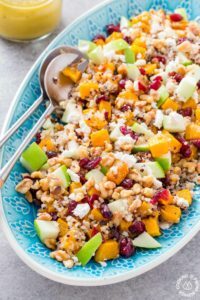 This Fresh Fruit Arugula and Quinoa Salad is the name of the game with this lighter, healthy and flavorful salad. 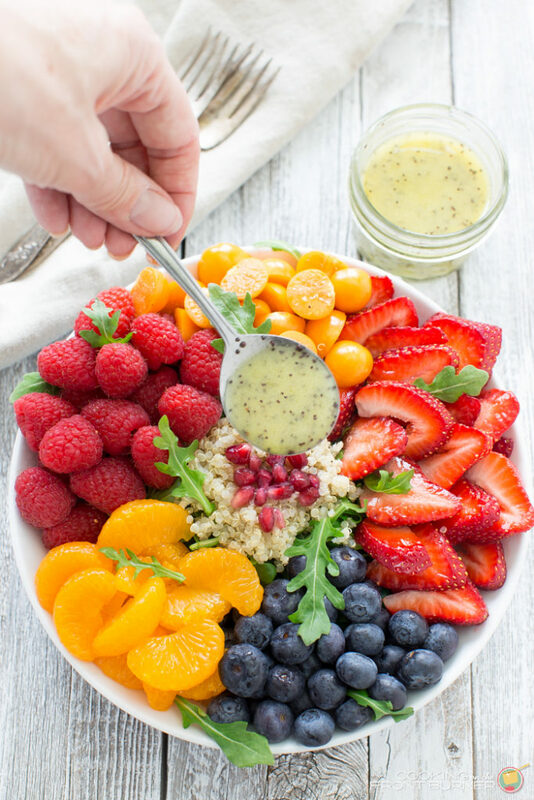 Loaded with fresh berries, arugula, quinoa and drizzled with an orange poppy seed vinaigrette! Quinoa salad is the perfect healthy dinner! 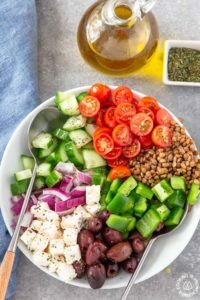 While we have been enjoying this salad, this post almost didn’t happen. 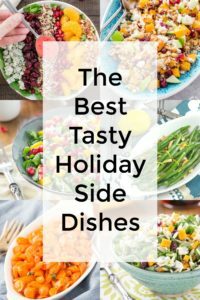 I had great intentions to post this last week as my first recipe of the year when all the pictures turned out like crap. I have no idea what I was doing wrong. Was it the light, composition or just me having a bad photography day? I think it was a trifecta. So I got pretty discouraged and put this idea on the back burner until I could get over my defeat. Well, today I was determined to get the shot and hopefully share my success. I traded in the original idea of wooden bowl for a white one and the dark background board for this white one and ta da, this captures what I had in mind when I first wanted to share this beautiful quinoa salad with you. 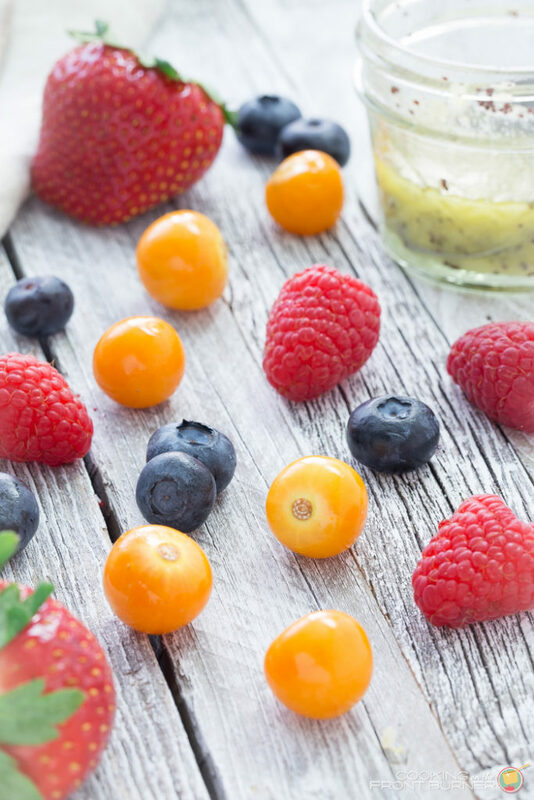 Can you name all the fruits in the bowl before reading the ingredients? One might stump you – it looks like yellow cherry tomatoes but it isn’t – keep reading to see what it is! 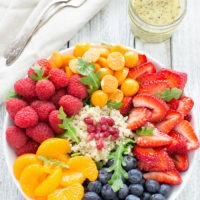 I hope you enjoy this fresh fruit arugula quinoa salad! So, did you guess golden berries? 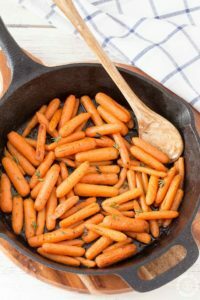 We have been enjoying these lately and they make a great addition in salads or for just snacking. They are a bit tangy and have a nice bite to them. Another fruit that would be good are blackberries, so be sure to make this quinoa salad your own with your favorite fruits. Looking for other salads? Be sure to check out my recipes for Jicama Salad with Orange Vinaigrette and this Italian Chopped Salad to get eating right! 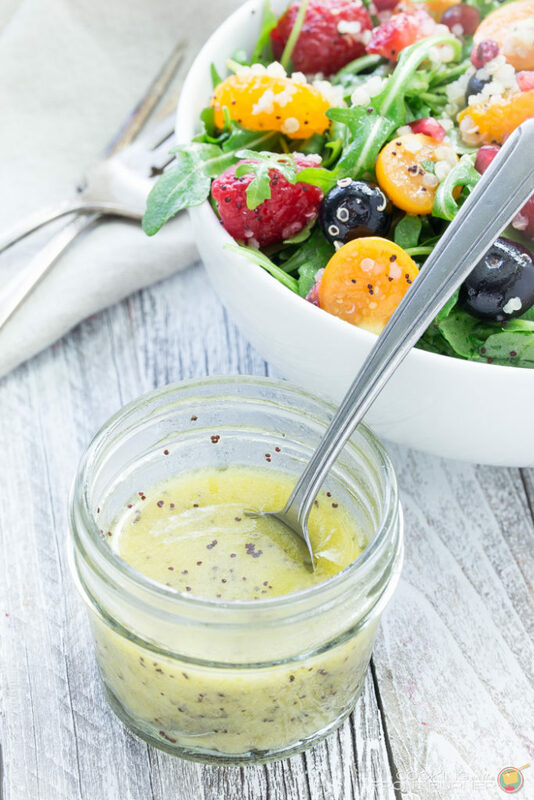 You will love this dressing too! It is so light and a little goes a long way. 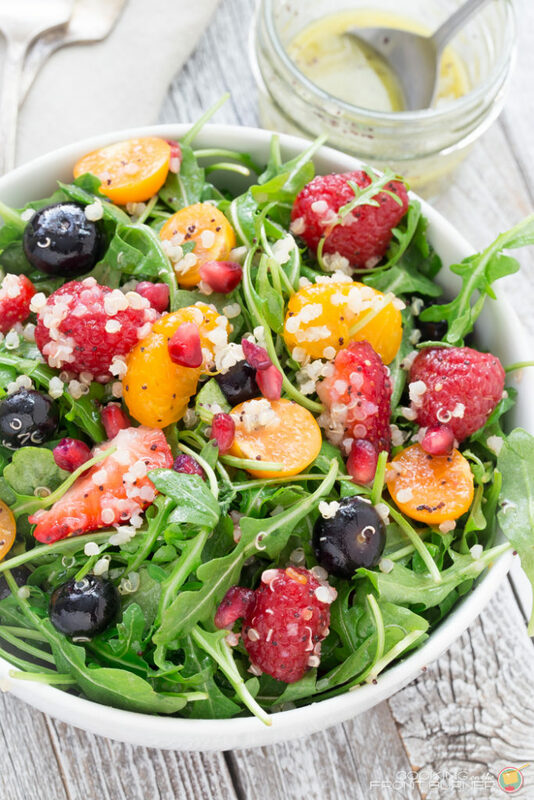 Fresh is the name of the game with this lighter, healthy and flavorful salad loaded with fresh berries, arugula, quinoa and drizzled with a orange poppy seed vinaigrette! 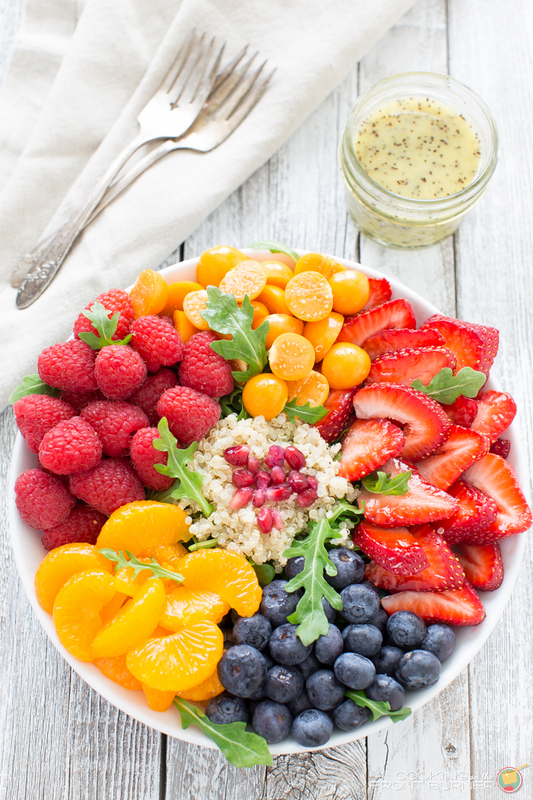 In a large bowl combine the arugula, blueberries, strawberries, raspberries, oranges, golden berries. pomegranate seeds and quinoa. That is such a good idea ! I really really looooooove it and it look sooooo delicious !. If you don’t mind I would like to link your post in one of my future Friday Favorites . I loooove arugula and quinoa, but haven't put them together yet. This looks gorgeous and so delicious! Pinning this to try later! This salad looks so good. I love all fruit salads. This one has such pretty color as well as being healthy. Visiting you from the Pin Junkie Pin Party and loving the looks of this recipe. I’ll replace the honey with stevia or maple syrup so it’s vegan and reduce the oil so it fits into my low fat eating plan. Please visit my blog for yummy recipe ideas as well. Looks so good I want to dive right in. Just had to share on my social media sites. Come visit some time.